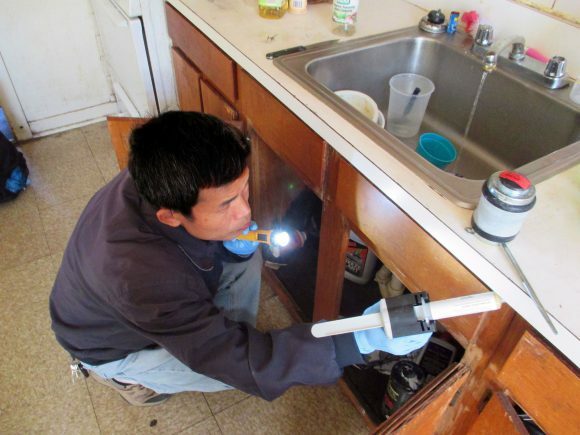 Share the post "How to Get Rid of Cockroaches and Other Pests: Keep a Clean Home, Rutgers Scientists Say"
Changlu Wang, associate extension specialist, at work in one of the apartments. Photo: Changlu Wang. Your mom’s advice on keeping a home free from cockroaches and bedbugs is reinforced by science. To keep these pests from invading, follow the common-sense rules of cleanliness. To kill them, use traps and bait. Don’t bother using foggers, sprays and aerosols, which are less effective and can contaminate food, floors and counters. These insights were confirmed by a seven-month collaboration between Rutgers University-New Brunswick and the New Brunswick Housing and Redevelopment Authority and led by Changlu Wang, associate extension specialist in the Department of Entomology at the School of Environmental and Biological Sciences. 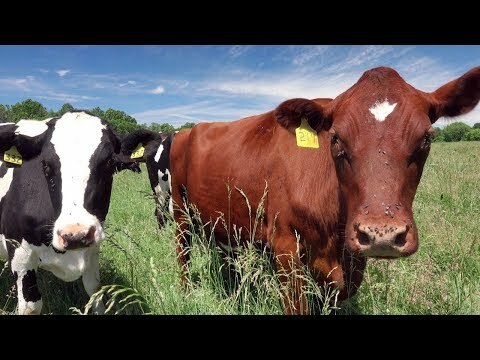 The resulting study is published in the Journal of Economic Entomology. Wang and his team did their survey in a public housing project with 258 apartments in 40 buildings. Their first step was to find out which pests, and how many of each pest, lived in those buildings. Cockroaches were present in 28 percent of the apartments; rodents in 11 percent; bedbugs in 8 percent. Surprisingly, this kind of pest data for an entire community is hard to come by, Wang said. 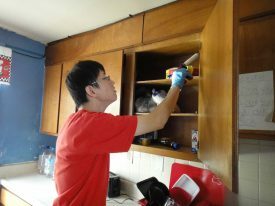 Chen Zha, graduate student and a co-author on the paper, at work in one of the apartments. Photo: Changlu Wang. Wang and his team visited all accessible apartments in the community and set traps in strategic spots in each apartment, which not only helped them identify pests but identify where they were coming from. 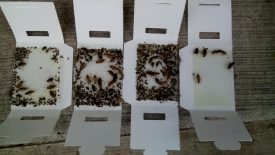 They then treated those apartments using baits and traps, and reduced the number of cockroach infestations by 85 percent over seven months. As they counted cockroaches and laid traps, Wang’s team also talked to the residents about how to avoid cockroaches in the first place and how to deal with them once they arrived. Traps laid in a single apartment. Photo: Changlu Wang. This story appears on Rutgers Today.